From the Star Wars Forces of Destiny collection by Hasbro. Star Wars Forces of Destiny Princess Leia Organa Adventure Doll. From the Star Wars Forces of Destiny collection by Hasbro. Star Wars Forces of Destiny Princess Leia Organa Adventure Doll. Doll comes with a cloth costume and rooted hair. Measures 11 inches tall. Help me Obi Wan your our only Hope. 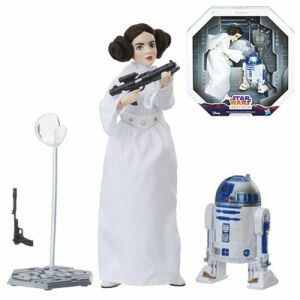 Hasbro Star Wars Dolls shipping from Canada. No Surprise Border fees or Customs!